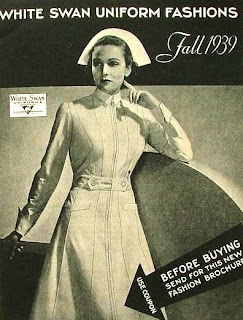 All of us have seen those pictures of nurses looking much akin to stylish angels in white. Starched and the very picture of cleanliness they were more apt to be holding a lamp (tribute to the revered Florence Nightingale) than a Foley Catheter (which would not be in good taste of course!). This image of nurses is a very pleasant one indeed. What little girl doesn't want to grow up to be like the pretty lady in white? In fact, the day I got my student nurse uniform in the mail was a happy one indeed! Here was my chance to look like a starched angel in white! Putting on that uniform made me feel composed, knowledgeable and incredibly professional! It was marvelous! This morning I step foot in a hospital for the first time in uniform. I experienced many conflicting feelings: awe, fear, euphoria...I couldn't quite decide how I felt. As I devotedly trailed my clinical instructor, flipped tentatively through charts and was shown medication scanners etc. I saw things a little differently. One look and I knew beyond a shadow of a doubt that my "starched angel with a lamp" image was grossly inaccurate. You might think I was disappointed, but indeed I was not! What I saw instead were highly talented "wonder women" who juggled baths, meals, meds as if it was second nature! They read the doctors chicken scratch notes with ease and worked around nitty gritty policies with unstudied efficiency! Jaw-dropping! Truly jaw-dropping! It may be hard for you to see the astonishment factor in what I just described if you have never tried filling the shoes of a nurse before. Let me enlighten you...the hospital beds can out smart an average person, the docters handwriting really does looks like chinese and once translated might as well be greek! In order to just get your patient a toothbrush you must not only remember a certain combination to get into the storage room, but also know how to scan and charge to either floor or paitent etc. etc. When I pictured being a nurse I picture many challenging situation, but not these! I guess my image of nurses has shifted from gliding angels of white to a more realistic view. I may be far from composed and stately as I rush around, but I'll still be helping people and thats what counts.